Will Writer Estate Planning Software enables your to create various estate planning documents from wills to trusts to powers of attorney and much more. 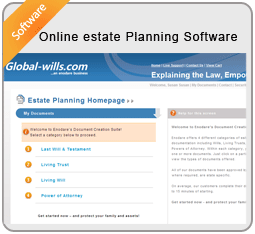 The software contains a built in 300 page estate planning guide to aid users step by step though the process of creating documents, ensuring the user is fully informed throughout the decision making process. 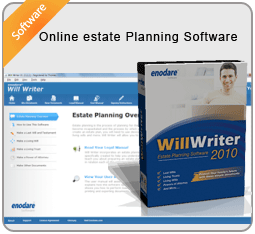 Enodare offers a variety of online estate planning software catering for the creation of Legal Wills, Living Trusts, Powers of Attorney and Living wills and more. Our software has been tailored for each country and deployed across enodare owned websites in various countries worldwide!